Wizards of the Coast recently announced that it was allowing its license to create Star Wars role-playing games and miniatures to lapse. However, before the product line became one with the Force, WOTC gave one last gift to old-school fanboys. The final miniatures set, “Masters of the Force,” includes all eight of the “chess monsters” seen in the original film. The scene was a throwaway bit in which R2-D2 and Chewbacca passed the time by playing a holographic board game. 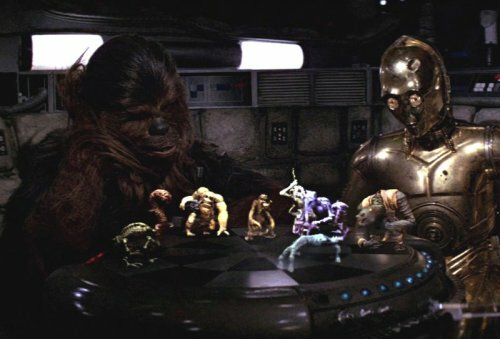 Chewie’s poor sportsmanship–and the threat that he might pull someone’s arm from the socket–elicited C-3PO’s timeless advice, “Let the Wookiee win.” Special effects artists Phil Tippett and Jon Berg created the charmingly crude stop-motion monsters that squeaked and hissed at each other across the chess table. I love the odd looks of these whatsits. They suggest the crazy biological diversity of a galaxy far, far away in a way that subsequent Star Wars productions never have. These days, they naturally have been forced into codified confinement. The space chess game was given a name (dejarik) and each of the creatures a detailed background. In other words, all the fun has been surgically removed. As for the miniatures themselves, I placed an order and received seven of them earlier this week. (The eighth is still to come via a separate order.) Here they are! Best of all, they’re just the right size to stage my own space chess match! Wookiees, of course, will not be invited.